The Tritone Hotel, in the popular resort of Abano Terme (Padova), is a classical and refined structure, surrounded by the green Colli Euganei hills, ideal destination to recover body and soul wellbeing in an atmosphere of total relaxation. For forty years at the helm of the hotel’s management, over the years the Poli family has been able to maintain very high accommodation standards. The two recent restyling interventions of the hotel must be read according to the perspective of a continuous improvement of the quality of the structure in terms of aesthetics and performance. Margraf Industria Marmi Vicentini, historical brand of the Italian marble, has played a leading role within these interventions, designed and directed by Ing. Miotto and arch. Mengato. The first intervention in chronological order (2009) referred to the treatment division within the mud area, on the ground floor of the building. 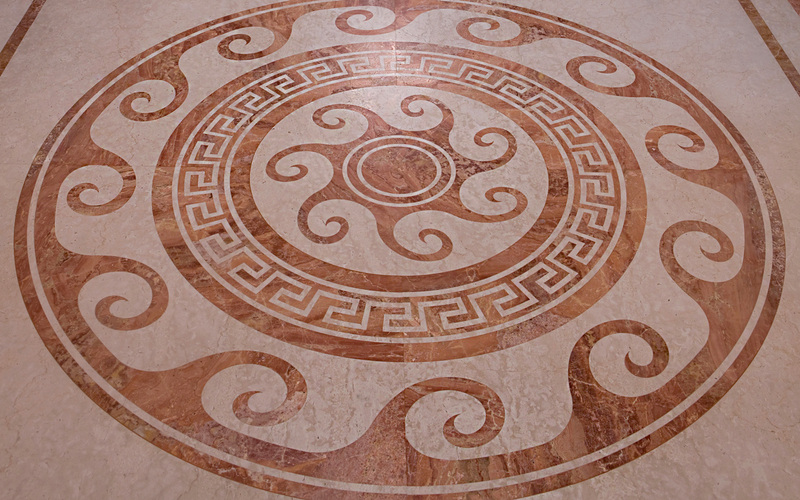 Here Margraf provided its marvellous marble for the coverings and the flooring made of Arancio di Selva marble - Margraf's exclusive marble - and Botticino Fiorito Light marble, in a polished finish. The result is a highly sophisticated environment in which each element evokes the myth and the classical period: from the Doric columns made of Botticino Fiorito Light to the high relief in Botticino marble depicting Triton, Poseidon’s son. Elegance and attention to details are the principles that also guided the second renovation intervention of the Hotel (2011), recently completed, in which Margraf marbles were chosen, once again, to give the rooms an atmosphere of exclusive elegance. The intervention resulted in a significant expansion of the restaurant on the ground floor towards the front garden (a charming panoramic gazebo has been built at the centre of it) according to an architectural structure that recalls winter gardens, with white doors and windows and glasses with glazing bars. 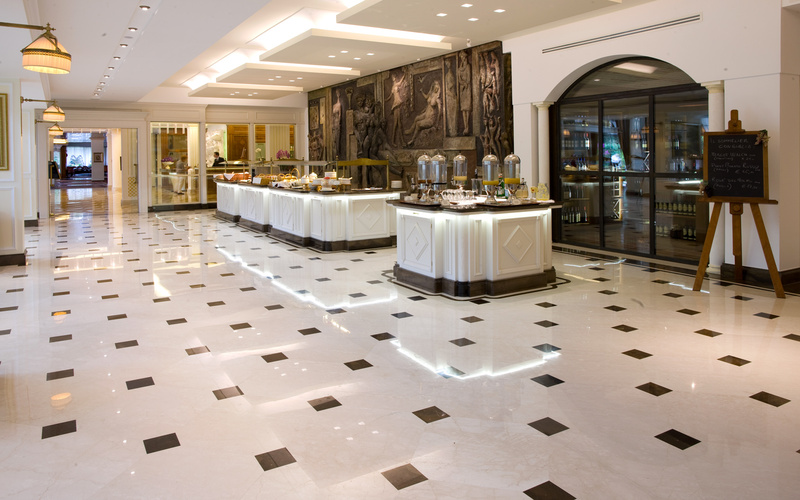 This bright environment, accurate in every detail, is the triumph of marble, signed by Margraf: from the 2 cm thick chequer-board flooring, in a polished finish, with Botticino Fiorito Light and Ebano marble inlays - the same material used for the skirting boards - to the Ebano marble surface of the elegant white wood buffet counters. The Vicenza-based company marble stands out even in the hall, completely reorganized and renovated: from the precious 2 cm thick chequer-board flooring, in a polished finish, made with Giallo d'Oriente, Ebano and Botticino Fiorito Light marble inlays - the same materials used for the skirting boards - to the new reception desk made of Ebano marble with a gold leaf treated base. 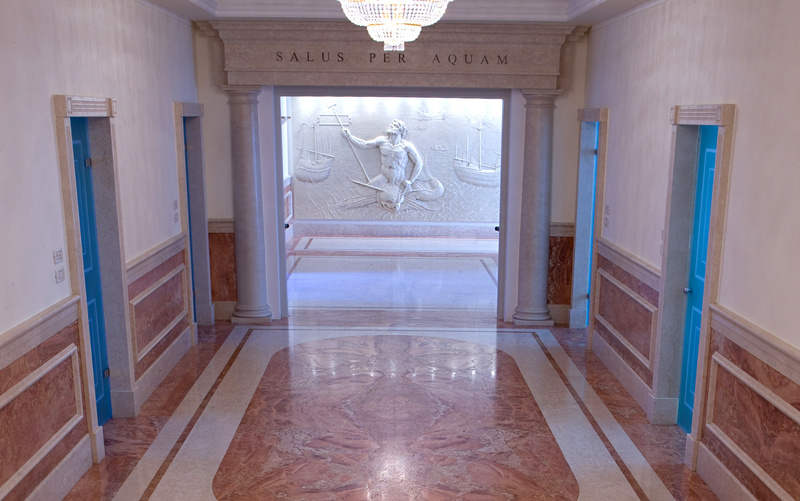 The visual effect is that of a vibrant multi-coloured carpet - whose preciousness is recalled by the lighting system with Swarovski pendants - developed starting from the new mantrap prospectively guiding the look up to the end of the hall, where the reception desk stands in stark chromatic contrast on a white backdrop embellished with a bas-relief related to the theme of water. The main principles are then research of quality and attention to details in each room. 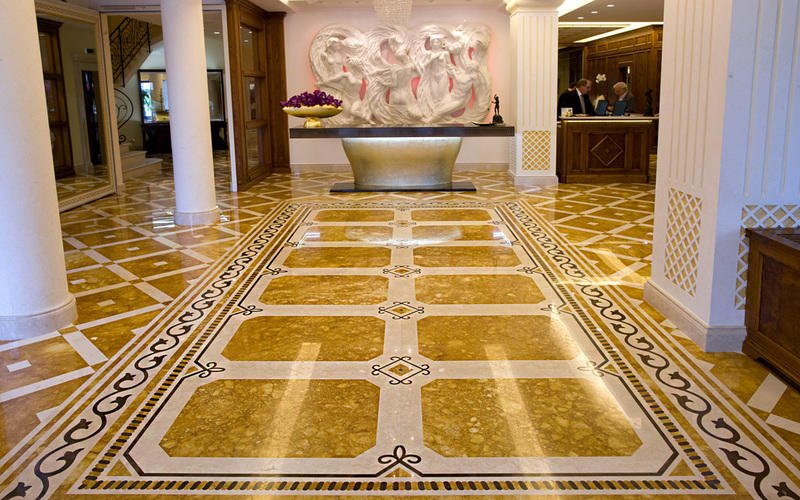 This is true even outside, where Margraf provided the precious Travertino Giallo marble, characterized by rich veins creating a striking dynamic effect, to coat the entrance wall of the Hotel, placed at the access of the driveway leading to the structure and visible from the street. It is a reminder of the preciousness of the materials used in the inner spaces, signed by the Italian company that has written the history of the world architecture.